You can find out more about my Super Monkey Ball costume at Super Monkey Ball costume. I really didn't have any pictures for the design of the sphere. I mostly came up with the final design in my head. 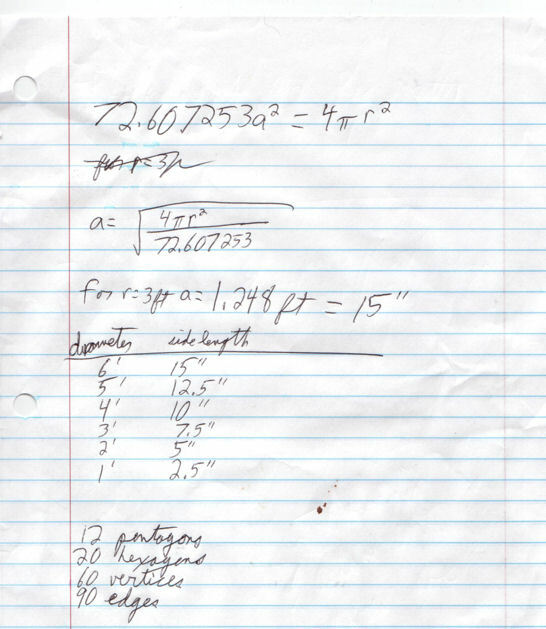 But, here we have the calculations for the side length of a buckyball. I initially had planned to make an actual buckyball, but it turned out to be too difficult. My attempts to drill holes in wooden balls failed. It was just too difficult to do accurately with the equipment I have. You can continue the Super Monkey Ball adventure at making the monkey costume.